Why is America so boring? I'm sure most of you are familiar with the Kit Kat, a candy which consists of chocolate covered wafers. According to Kit Kat stats from 2012, about 650 Kit Kat fingers are consumed every second worldwide. As Kit Kat bars usually have two or four fingers, that means about 180-325 of them are consumed each second. In the U.S., Kit Kats are the 5th most popular chocolate candy while in Japan, Kit Kats are their most popular choice. This might be a reason why Japan has so many more flavors and types of Kit Kats than the U.S.
Americans only have basically three Kit Kat flavors/types available to them, including the Original Kit Kats, Kit Kat White Chocolate and Kit Kat Miniatures. In Japan though, there have been over 200 flavors/types of Kit Kats, with new flavors being created all the time. That's quite a gap and the U.S. needs more than just two different flavored Kit Kats. Maybe if there were many different flavors, the popularity of Kit Kats in the U.S. would rise. In Japan, you'll find Kit Kat flavors including more unique ones such as Purple Sweet Potato, Edamame, European Cheese, Match-Green Tea, and Adzuki. Check out this list to see many of the other flavors that have existed and may still exist in Japan. Certain regions in Japan even have their own Kit Kat flavors, which are not available in the other regions. Part of the reason for the great popularity of Kit Kats may be that they are viewed as good luck, because the name sounds similar to kitto katsu, which roughly translates as "you will surely win" or "win without fail." Some of the unique Kit Kat flavors are popular with foreign tourists, such as the Green Tea Kit Kat. Due to its popularity, Nestle decided to create another unique flavor that they thought would appeal to tourists, one using Nihonshu, or as known in the U.S., Sake! This past February, the new Sake-flavored KitKat was released in Japan. It is not available in the U.S. 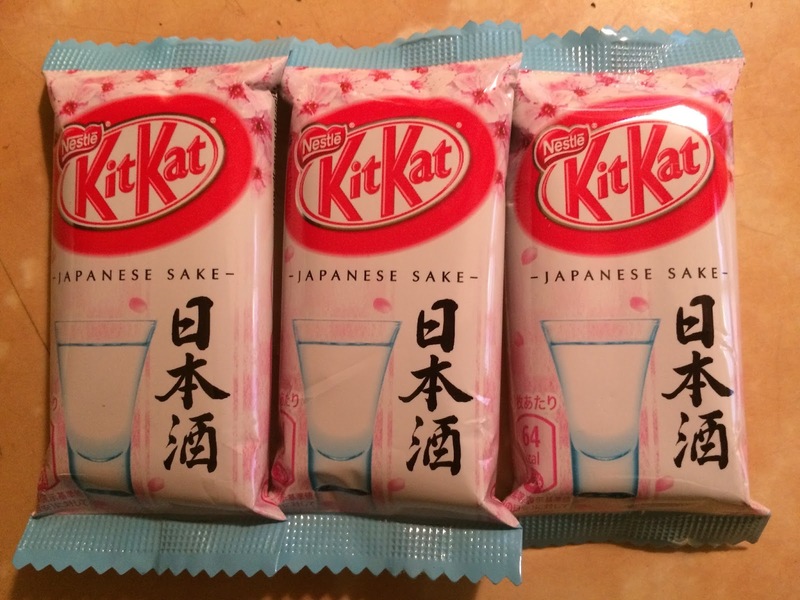 I was fortunate to receive one of these Sake Kit Kats as a New Year's gift from Deborah Fleig, one of the owners of The Floating World, an excellent small Sake importer based in New Mexico. I've previously raved about a number of the Sakes they have imported. The photo at the top of this post shows the packaging, a box with a pink sakura cherry blossom design and a bottle & glass of Sake. It costs about 150 yen, roughly $1.34 U.S. The photo above indicates the contents of the box, three packages, each containing a two-finger Kit Kat. They also sell a min-piece box for 700 yen, or $6.27 U.S. 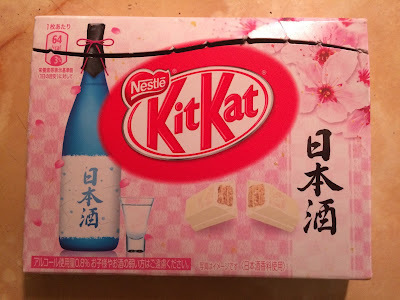 These Kit Kats are created with a Sake powder which is added between the white chocolate and wafers, and the candy actually has an alcohol content of 0.8%. That alcohol content prompted Nestle to provide a warning: "Children and lightweight drinkers are kindly requested for refraining from consuming this product." The Nestle website states that this Kit Kat possesses: "The elegant taste of Sake, wrapped in the gentle sweetness of white chocolate. You can enjoy the mellow, full-bodied flavor, and a refreshing aftertaste of Sake." From the outside, I couldn't detect any Sake aroma but once I broke it open, I could detect a subtle aroma of Sake, a hint of steamed rice and melon. And once I tasted it, I got a mild Sake note amidst the sweet white chocolate and crispy wafer. However, the more I ate, I realized there was a bit more of a Sake aftertaste. It was a pleasant Sake flavor, making this a tasty and interesting candy. It may never be sold in the U.S., so if you have a friend visiting Japan, ask them to pick you up some of these Sake Kit Kats. Thanks very much to Deborah for sending me this special Sake treat.